Every year, Anand Mahindra, vice chairman and managing director of the US$7.1 billion Mahindra Group, holds a two-day “blue-chip” conference with his top executives. The team reviews the year gone by and sets targets for the future. For the most recent conference held in December last year, Mahindra flew 500 of his top executives to Kuala Lumpur, Malaysia. On the second day of the conference, he deviated from the usual agenda, screening a short film about how the Mahindra Foundation, along with group company Mahindra Consulting Engineers, reached out to the flood-ravaged Pattori village in Bihar’s Madhepura district in northern India in 2008 by building a new social infrastructure. They built an eco-friendly village and provided amenities like water supply, sanitation, solar lighting and disaster-resistant dwelling units. The film had nothing to do with the various businesses of the group that range from automotive, farm equipment, aerospace and IT to retail and leisure holidays. But it was central to the conference. It represented Mahindra’s new vision for his team — to be innovative and rise above the ordinary. This vision has found expression through a new brand positioning and a new “core purpose” and tagline for the group — “Rise” — that was launched in January. The concept of Rise is built on three pillars: accepting no limits, alternative thinking and driving positive change. 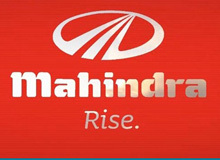 “Rise means achieving world-class standards in everything we do, setting new benchmarks of excellence and conquering tough global markets,” according to Mahindra. He dismisses any suggestion that the Rise tagline and accompanying strategy is merely about image building. “We are attempting to unify different businesses that share the Mahindra brand, and offer a compelling value proposition,” he says. “We felt the world was changing and we needed a platform to enthuse people to enable them to seize opportunities and fight challenges,” adds Rajeev Dubey, president, group HR and after-market. This is the group’s first rebranding exercise in over a decade. A similar exercise was done 13 years ago to outline the conglomerate’s core values. At that time, the brand identity was about the celebration of being Indian. The idea was centered on the belief that Indians are second to none, and that through the quality, reliability and durability of Mahindra’s products and services, the group would prove that to the world. But in a changing world, with India strongly established in the global economy, and with the group’s own businesses expanding to new sectors and new geographies, the conglomerate’s leaders felt that its central ideals needed to be redefined. “Every big company today has an identity crisis. They are all scratching their heads on how to increase stakeholder value,” says Scott Goodson, the founder of New York-based advertising agency StrawberryFrog, which was appointed two years ago by the Mahindra corporate brand council to create the new positioning. Indeed, over the past few years India’s business community has seen an increase in rebranding across sectors. The Thapar Group renamed itself as Avantha, Hindustan Lever became Hindustan Unilever and Anil Ambani’s Reliance ADAG (Anil Dirubhai Ambani Group) dropped its suffix. CEAT, Airtel and Bank of Rajasthan have all gone for a logo change. Anil Gupta, professor of strategy and organization at the University of Maryland’s Robert H. Smith School of Business, points out that there are many reasons why corporations decide to reposition themselves. For instance, if the brand has been weakened due to a crisis or catastrophe; when companies merge and want to forge a new identity; if a company wants to position itself at a more upscale level, and if there’s a spin-off and the new units need to create a fresh identity. At Mahindra, the US$27 million brand overhaul has been triggered by fundamental changes within the 65-year old group. Earlier, its image was one of being reliable, rugged and tough — all attributes associated with its traditional business of tractors and utility vehicles. With operations focused largely within the country, its tagline was “India is second to none.” While the farm equipment and automotive business continues to bring in the bulk (around 65%) of the group’s revenues, over the past decade it has expanded and invested in new businesses as disparate as aerospace, financial services, IT, hospitality, motorboats and real estate. Mahindra is now spread across 11 businesses and has a bouquet of 121 companies. The conglomerate has also moved beyond Indian shores. While it snapped up Kinetic Motors, Punjab Tractors, Satyam Computers and Reva Electric Car in India, an overseas shopping spree led to ownership of tractor businesses in China, forging units and a design studio in Europe, and aerospace companies in Australia. Mahindra now makes tractors in India and China and also assembles them in Africa, the U.S. and Australia. With assembly plants in Brazil and Egypt, Mahindra sports utility vehicles drive across Italy, South Africa, Uruguay and Serbia. The group is gearing up to begin selling pickup trucks in the U.S. The group’s most recent and high-profile acquisition is Korean automaker SsangYong Motor Company. Earlier in March, Mahindra completed its purchase of a 70% equity stake in SsangYong for US$463 million. The conglomerate does not reveal global projections. But analysts say that the consolidated global business which currently brings in 19% of the group’s US$7.1 billion revenues could gallop to 30% once the integration with SsanYong is completed. The lack of articulation is seen as having impacted younger employees and those who came along with the acquired companies. “Somehow, Anand Mahindra’s persona of a progressive businessman did not rub off on the group,” according to Santosh Desai, managing director and CEO of the consulting firm Futurebrands. There are of course pockets of excellence within the group. The multi-utility tractor Shaan, for instance, is used for farming, hauling produce and even transporting people; thus maximizing a farmer’s revenues. Mahindra Finance helps farmers buy Mahindra tractors and pickup trucks, and even build homes. To ensure regular loan collection, it has shunned the agency model and has company staff stationed in rural India. Then there is the premium Mahindra Holidays & Resorts, which has launched affordable sub-brands to rope in more travelers. Mahindra Homestays caters to budget travelers, Zest to youngsters and Terra camps are aimed at the adventurous. Mahindra Lifespaces has been working to develop eco-friendly real estate. Instead of applying only cement to surface-coat building roofs, it now uses an additional layer of broken ceramic tiles over the cement, which helps to bounce light and minimize heat absorption. But such innovations can happen across the group and on a sustained basis only if employees are highly motivated and have a strong sense of belonging, experts say. Mahindra has 113,000 plus employees located across 79 countries. With 12% of them foreigners and Indian expats, the group’s earlier tagline of “India is second to none” was clearly obsolete and inappropriate. “International employees are not going to be motivated to come to work by saying that ‘I come to work because I want to prove that Indians are second to none,'” notes Ruzbeh Irani, executive vice president, corporate strategy and chief brand officer. With the Rise tagline, “we now share a homogenous image,” adds Ramesh G. Iyer, managing director of Mahindra Financial Services. The image is vital. Around 60% of India’s population is under 25, making wooing and retaining younger workers a priority for India’s business community. “Unless you hook a company’s aspirations to the youngest of them all, you are not going to be perceived as contemporary or relevant,” according to Bangalore-based brand strategy consultant Harish Bijoor. Getting people to buy into the brand ideology is no easy task. “We have to [encourage] people to seize opportunities and fight challenges to create competitive advantages and sustainable outperformance,” notes Dubey. The focus now is on how to create conditions that promote innovation, and allow people to thrive and fuel Mahindra’s businesses with quality products. To make that happen, Dubey’s team has been documenting innovations across the group. Product and service quality is gauged based on customer satisfaction. Businesses receive a customer-as-promoter score based on whether customers recommend the Mahindra brand to others. There is also an employee-as-promoter score, which asks employees if they would recommend people to join the group. These two matrices will be the yardstick to measure if workers are playing it safe or taking risks. Employees, though, have their concerns. “Many people internally are worried about what the new program means for them and their business,” says 24-year-old Alastair Trueger, a Mahindra global recruit from Brown University. Trueger is part of the corporate strategy team. He continues to tweak the group’s website, which he revamped to reflect the new positioning. Trueger’s two-year term ends in another six months, but he’s hoping to stay on at Mahindra. Perhaps even more difficult will be to get the consumers on board. “Remember, not everyone wants to, or will be, as involved as the employees,” ISB’s Samu warns.